Mass Effect 3: Leviathan is the first story-driven, single player DLC to be made available since Mass Effect 3 Extended Cut. Leviathan expands upon the events of Mass Effect 3 with gripping and emotional storytelling, compelling new characters, powerful weapons and unique upgrades. Players will be able to discover more about the origins of the reapers as they race across the galaxy to unravel the mystery that surrounds the fabled Leviathan. 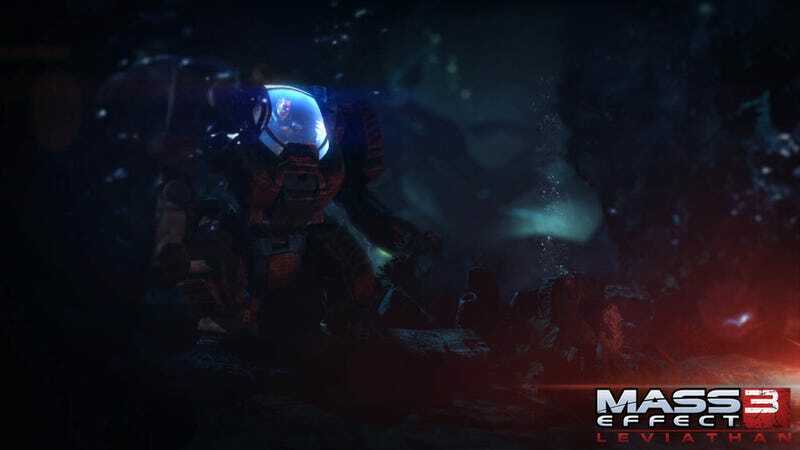 Update: One of our reporters on the scene says the DLC will take you underwater in a mech suit (as seen in one of the screenshots above). There is some sort of giant derelict down there, maybe a Reaper. And there are jellyfish. Lots of them. The idea is that the expansion "takes you to new depths of the galaxy". Taking place during the events of Mass Effect 3, players will be thrust into the darkest corners of space where they will hunt a mysterious being rumored to be powerful enough to destroy a Reaper. As they race against time, they will begin to unravel the secret of the Leviathan. Explore uncharted systems and new areas on the Citadel, interact with brand new characters, unlock the AT-12 Raider shotgun and M-55 Argus Assault Rifle and discover more about the mysterious history of the Reapers. Available on PC, Xbox 360 and Playstation 3. Cost is $10 or 800 Microsoft points. New areas of the Citadel. Huzzah!